As a chiropractor we look to the spine for problems in alignment as the primary source of poor health. Chiropractic is based on the scientific fact that the nervous system controls virtually every cell, tissue and organ of the body. The brain sends a signal down the spinal cord and out to the nerves to the entire body. When a vertebrae moves out of proper alignment and pinches, irritates, or stretches a nerve, this in essence turns off the power to the body and the result is poor health. This is what is known as a Vertebral Subluxation. While some can comprehend the immense complexities of the nerve system, most cannot. It is for this reason we use a technology to quantify and interpret these nerve impulses so that the general population can understand the damage that has been done to their bodies from the Verbal Subluxation. Equally important, the patient can systematically watch how their body becomes healthier as the Subluxation interference is removed. The nerve scan test technology quantifies the nerve system into one number called a Neurospinal Functional index or NSFi. 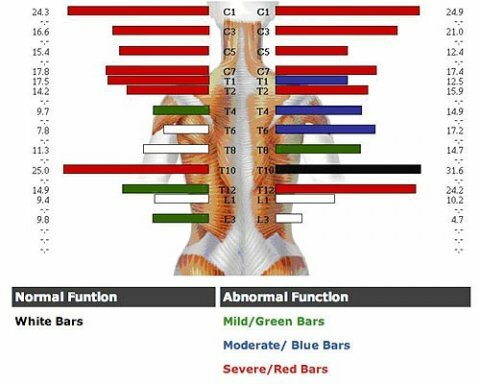 By this simple use of the graph, one can summarize all aspects of the nervous system, and determine if the patient’s health is excellent, good, transitional, challenged, or very challenged. All five aspects of the nervous system are tested, and interpreted by the doctor. Debbie became a new patient in this office like so many others, on the advice of her friend. Her decision was made despite the fact that she had vowed not to go to another chiropractor after using several over the years with no results. She was intrigued by the scans she was told about, and wanted to see if hers would tell her anything about why she wasn’t healthy. During her report of findings (the period when we review the test for the patient) she was shown her results and clearly understood for the first time, the function of our nervous system. The scans communicated the importance of our nervous system in relationship to health. After spending $100,000 on medical bills in her attempts to get well, which left on state assistance, she finally understood what was wrong. After seeing these results, she brought in her children to be scanned and referred dozens of friends. Debbie now knew what was wrong, and we explained how we are going to fix it, how long it would take, and how much it would cost. Debbie continues her care following our recommendations and she could see the results for herself, as she was rescan. Her symptoms resolved quickly, but she continued her care because she understood that a healthy nervous system is responsible for good health.